Here’s what I’ve been working on while visiting my family in San Francisco. 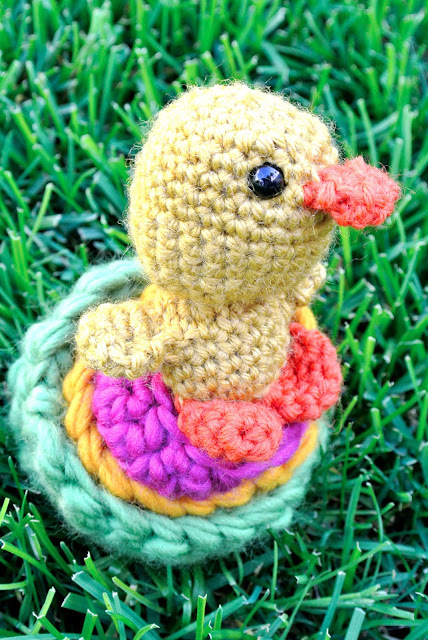 Miniature amigurumi duckling nestled into more of my favorite baskets. This set is an Easter gift for my little five year old niece who loves everything miniature and cute. 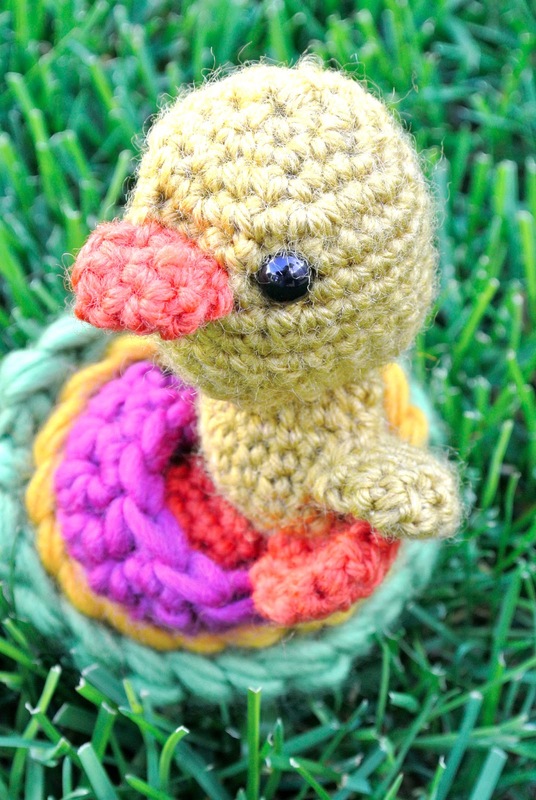 The pattern for the duckling is from the book, Amigurumi World. Finished duckling measures just over three inches from head to stretched out feet. 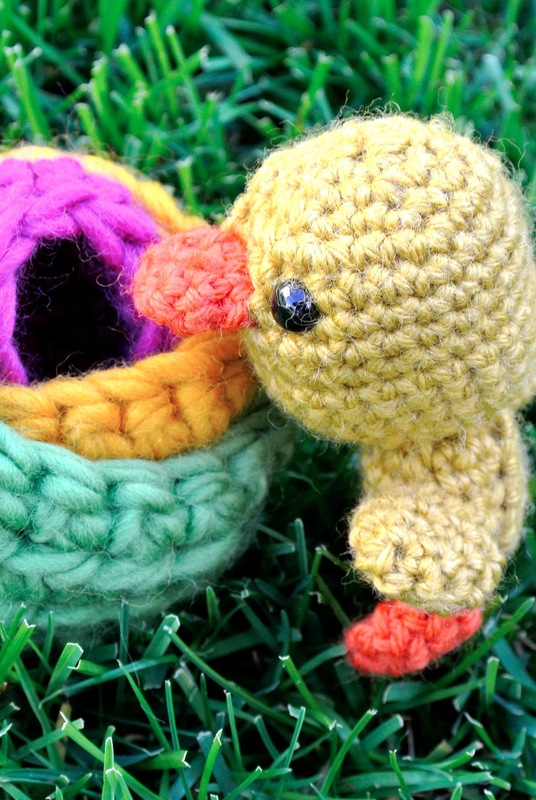 The pattern for the baskets is almost the same as the one I shared in my post, Amigurumi Fido. 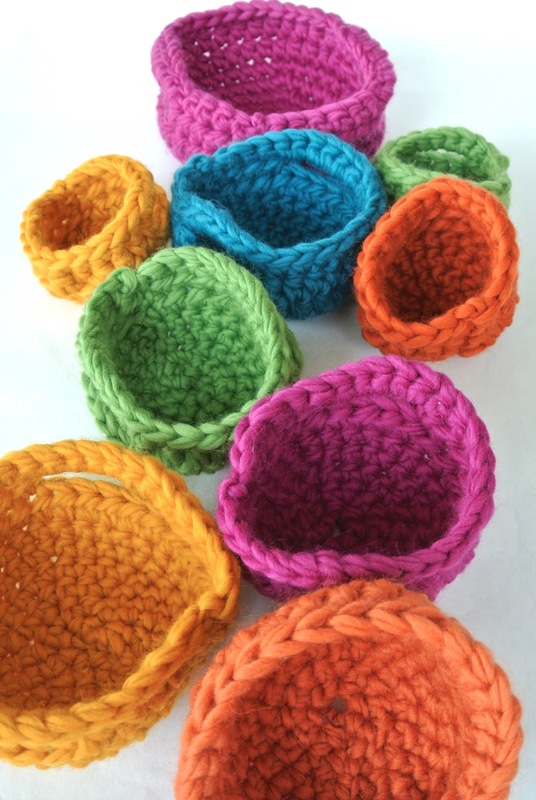 For these smaller baskets, I increased only to 12, 18 and 24 stitches on the base of the pink, yellow and green baskets, respectively. I also adjusted the count of stitches for the row where the handle is created. If anyone needs specific instructions for this, just comment in & let me know. And now that the duckling is complete and ready to be presented on Easter Sunday, I need to shift crafting gears. Promised to make my brother something very cool months ago… but never got around to it. He & I will be knotting rope & drinking wine later today. Now doesn’t that sound like fun? It’s a peanut butter and jelly sandwich. It’s also the set up for a math problem I presented my fourth grader, Simon, with. Story problem goes like this: Dad makes Si a PBJ using bread that measures 4 inches by 5 inches. But before Si can eat it, Mom cuts a perfect 1 inch by 2 inch rectangle out of the soft yummy middle for herself (yes, sometimes I do mess with the boy-os like this). What is the remaining surface area of that top slice of bread? Remember solving for these “find the area of the shaded region” kind of problems? The answer we’re looking for here is that the surface area of “square doughnut” is simply the surface area of original sandwich face minus the surface area of small rectangular “bite.” In numbers, the answer is (4 x 5) – (1 x 2) = 20 – 2 = 18 square inches. There are multiple steps involved to solving this type of problem. Let’s break it down. Recognize how to break a problem into manageable pieces. Here, the thought would be: There is no specific formula to solve for area of a “square doughnut.” But I do know the formula for a rectangle… Oh! Can I solve this problem by manipulating the area of two rectangles? Identify the applicable formula(s). The area of a rectangle is length times width. If necessary, solve for missing values given initial set of information. Not needed in this example. Perform the actual algorithms. 4 x 5 = 20. 1 x 2 = 2. Know how to manipulate calculated numbers to arrive at final answer. It is not enough to just crunch out “length times width.” In this problem, I need to subtract area of smaller rectangle from area of larger rectangle. Clearly state the complete final answer (including units of measurement). The answer is not just “18.” At the very least, I need to write “18 square inches.” Or better yet, I could write something like “the surface area of the remaining sandwich face is 18 square inches. This is not easy stuff. Think of multiple part math problems like patting your head, rubbing your tummy, marching in place while singing a tune all at the same time. Each individual piece may not be that big of a deal, but pulling it altogether can be tricky. Here’s another area problem. I worked on something similar with a bunch of fourth graders the other day (I volunteer at school once a week – math workshop with a 4th grade class is one of my stops). The kids at school had a terrible time with this problem…. which then really piqued my interest on how to help them (or help their parents help them) understand how to attack it. There is some missing information that will have to be solved for. I.e., I did not label every length in the original figure. Assume all corners are right angles. There is more than one way to solve this problem. In the above picture, I’ve drawn out the four ways the original shape could be broken up. While I think it most natural to sum the area of two small rectangles (Method #1 or Method #2), it seemed that many of the children gravitated towards finding the area of the large rectangle first and then subtracting out the area of the corner rectangle (Method #4). Kids seem quick to dismiss their own approach to a problem in favor of following the other children’s calculations. I encourage them to try their own way first and then compare final answers with their neighbors. I ask students if their answers agree with each other. If not, I ask them to figure out what they did differently from each other. If yes, I confirm if the answer is correct or not. Always possible that the children all made the same mistake. Solutions can go awry anywhere along the 6 steps specified above. Patience, organization and ability to compute those basic algorithms super important. After working with the other fourth graders, I was curious to see how my own boy would approach this type of math problem. Hence my quizzing him. We worked out the second problem independently of each other. Si & I each arrived at the answer, 203 square centimeters. Does your answer agree with ours? 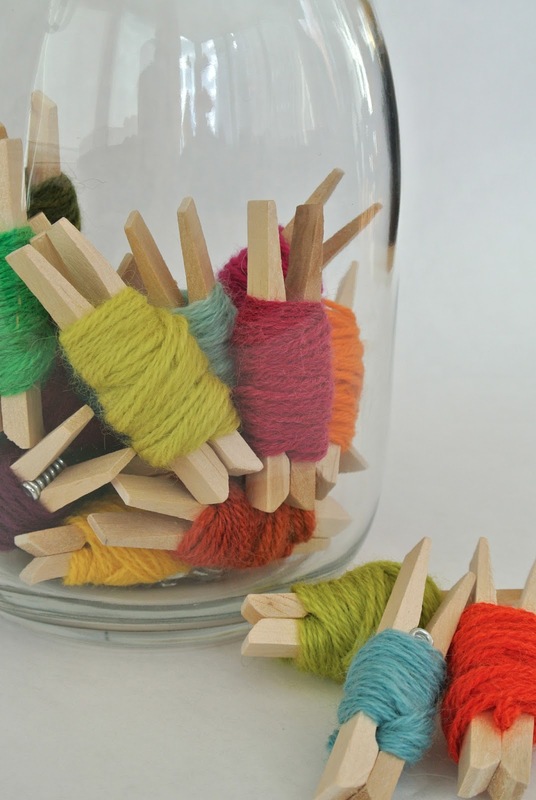 Making something beautiful can be as simple as winding strands of tapestry yarn on clothespins. What I really needed to do was to finish my chores and pack for our spring break trek to San Francisco. Instead, I was delightedly sorting through a windfall gift of someone’s collection of knitting and needlepoint supplies. 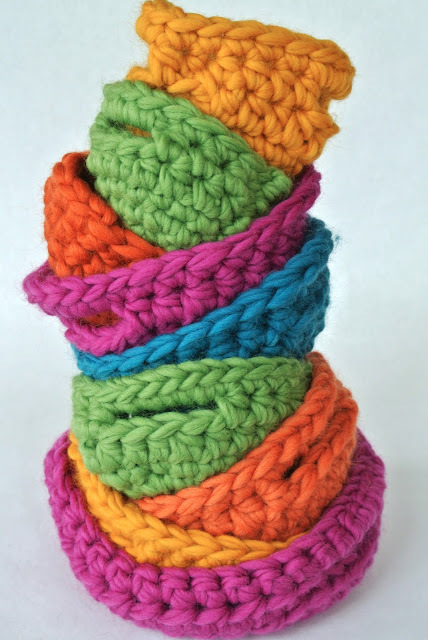 In particular, the colorful selection of tapestry yarns captured my attention. I sorted them out by color and shade. Pulled tangled yarns apart and rewound them into mini-skeins. Lined them up in rows. And then thought it’d be a shame to just box them back up again. I wanted to put some out on display. 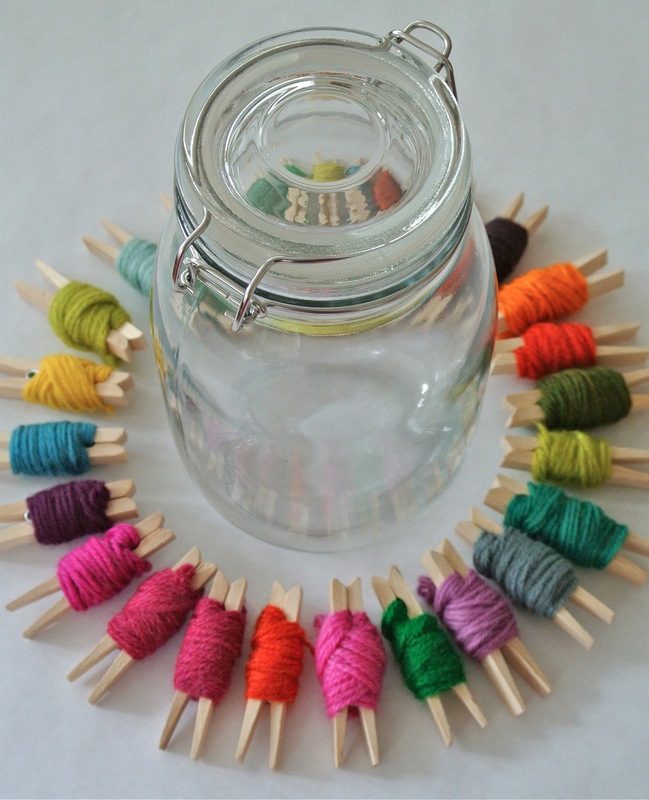 Decided to just wrap a selection of the brightest and prettiest colored yarns about two dozen clothes pins & then display in a big canning jar. Simple. Warm. Decorative. Bright. Homey. I love this look. I really like making this particular basket. Love the shape and the handles. I also think it’s relaxing to crochet these. There’s a little bit of counting involved, but it’s simple enough that my fingers can learn the rhythm which frees me up to chat or watch a little TV as I make. The first time I tried the pattern, I made myself two larger basket to hold yarns and such. Then I made a second set and sent them to my Momsy. Last week, I adjusted the size and made a mini-version of the basket for our Amigurimi Fido. … Nine more of these little guys! I think they’re so cheery and cute. They could be simply stacked and displayed for decorative purposes. Or used to hold office supplies like clips, erasers, business cards and pens. Or, since Easter is right around the corner, used to hold chocolate eggs and other Easter treats. I love the look of all my odds and ends crafting bits displayed in these baskets. I had so much fun making the baskets & then figuring out what I could store in them. And now I’m staring at this close up with these clothes pins… just had a new picture flash in my mind of what I could use these things for… so if you excuse me, think I have time to put together just one more crafty thing today. 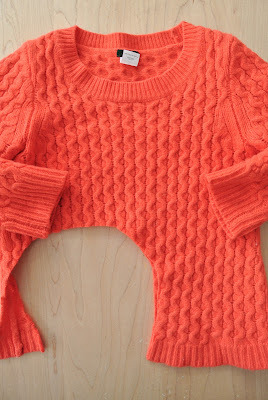 One of items was a gorgeous J.Crew coral sweater she’d inadvertently felted in the wash. She was really sad to let the sweater go. But it had shrunk beyond wearing… as a sweater, that is. I thought it’d make a beautiful hat for her charming little daughter. For last week’s sewing lesson with Nasya (sewing instructor-extraordinaire), I packed the sweater and a simple child’s knit hat to use as a pattern. Remember the first upcycling rule? Reuse as much of the original garment as you can. No need to knit ribbing when the edge of the sweater already has it. We lined the pattern-hat to the edge of the sweater, pinned and cut. Next, I sewed the seams together using a stretch stitch on the regular sewing machine. Then I trimmed and finished the raw edges on the serger. Lastly, I ran the thread ends back into the stitches, knotted them & cut. Flipped the hat right-side out, smoothed out seams and pressed. I’m still working on sewing smooth curves… as you can see from the finished product. Still, I think the result decent for a first go at sewing on knit fabric. 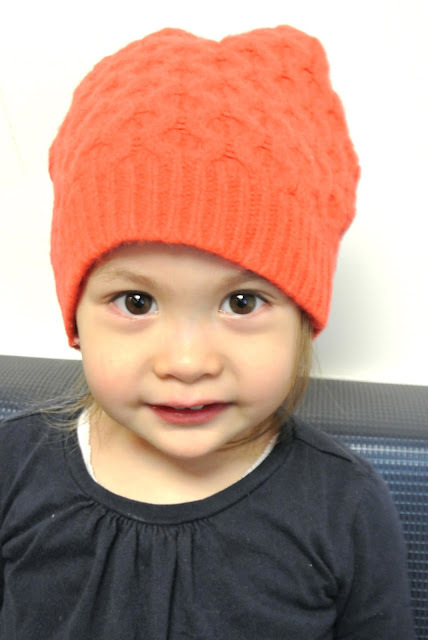 The only thing left to do was to deliver the hat to the adorable little Evie. Little girl loved trying on her new hat, dancing about in it and posing for pictures. There’s still quite a bit of sweater fabric left. Planning to use the large pieces for some kind of patchwork something. But I have something else in mind for the sleeves… I’m thinking matching leg warmers will go just perfectly with that hat.